Treat yourself and purchase gifts with confidence: every purchase will directly support The Gorilla Organization and its community development and gorilla conservation projects. "When you realize the value of all life, you dwell less on what is past and concentrate more on the preservation of the future." 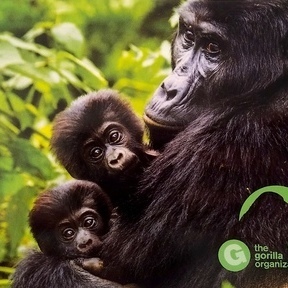 The Gorilla Organization works internationally to secure the long-term survival of the world’s last remaining gorillas in the wild. Our work combines traditional gorilla monitoring and habitat conservation projects with research, education and community development in areas adjacent to the gorilla habitats in Rwanda, Uganda and the Democratic Republic of the Congo (DRC).